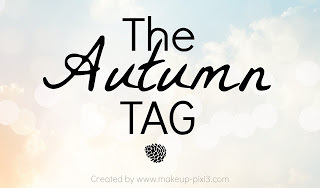 Hello every one, it's here my favorite season of the year, I just love the colours of the leaves at this time of year it just makes everything so pretty, so how fitting is it that my friend Vicky has tagged me in the Autumn Tag. You can check out Vicky's blog at http://heartsstarsandtea.blogspot.co.uk/. My favorite thing about Autumn has to be the changing of the leaves from green to those lovely yellows. reds, oranges and browns. It just all looks so pretty. I also love walking through those crunchy fallen leaves, I guess my childhood love of running through them when I was younger to hear the crunchy of the leaves still remains. I think this will be a favorite of most but it has to be hot chocolate and of course no hot chocolate is complete without some marshmallows! Vanilla...can't beat vanilla at any time of year. Currently using the Aveeno cream moisturiser its just lovely for helping with dry skin and hasn't caused any breakouts. Natural shades really light and medium browns nothing to fussy. Skinny jeans, loose vest like top with a coloured string top underneath, cardy, lilac and white checked vans and my black and purple Superdry jacket for ventures outside. Thanks for tagging me Vicky!